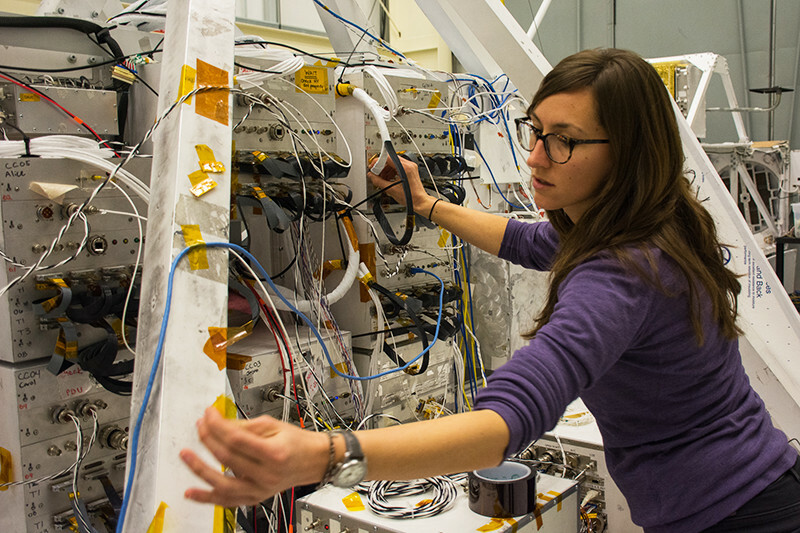 Former SSL graduate student Nicole Duncan makes final preparations to the Gamma-Ray Imager/Polarimeter for Solar flares (GRIPS) payload. Duncan is now an Advanced Systems Manager at Ball Aerospace. Graduate students from Physics, Astronomy, Engineering, and other UC Berkeley departments can find a wide range of research opportunities at SSL. The following is a list of current graduate student openings at SSL. For each research opportunity listed, please contact the PI or project manager directly as indicated to discuss your interest in the project. Graduate students are also highly encouraged to review SSL’s Directory of Researchers and contact PI’s directly if interested in their research, regardless of whether or not they have indicated a graduate student opportunity below. The Compton Spectrometer and Imager (COSI) project has an opening for a prospective graduate student who is interested in working in the area of high-energy astrophysics instrumentation. COSI is a wide field gamma-ray imager designed for studies of electron/positron annihilation emission, nuclear lines, and polarization of emission from compact objects and gamma-ray bursts. COSI had a successful flight on a superpressure balloon in 2016, and work to prepare for future flights is underway. The specific selection of available tasks above will depend on the progress in the timeline of the project, and the student’s experience and preferences. Please see http://cosi.ssl.berkeley.edu/ and contact Dr. John Tomsick for more details. The Gamma-Ray Imager/Polarimeter for Solar flares (GRIPS) mission is a NASA-funded balloon-borne experiment that can do imaging spectro-polarimetry of solar flares in the ~20 keV to ~10 MeV range, with 12.5″ FWHM spatial resolution and ~1 keV spectral resolution. It first flew out of Antarctica in January 2016. The flight lasted twelve days, and landed on the ice, several thousand kilometers from McMurdo. While the data vaults were recuperated within days, the full payload spent a full year on the ice before being recovered and transported back to SSL. 1) Analysis of the anti-coinscidence shield data – The data from BGO anti-coinscidence shields around the main GeD detectors are the easiest to analyze (12 countrates in 4 energy bands each), but will require refining the current mass model to determine the direction of a long and intense burst of X-rays from the Earth’s atmosphere observed during the flight. This work is an excellent introduction to data analysis, and the associated science, along with the possibility (but not a requirement) to delve into detectors and their electronics. This work is estimated to take about 6 person-months (including a first-author publication). 2) Spatially-differentiated germanium detectors (3D-GeDs): analysis of the flight data – GRIPS’s main 3D-GeDs have also well observed this hours-long atmospheric event. 3D-GeD data analysis will be more involved than the BGO one, but would be a great complement to task 1), as well as a great introduction to data packets, and the physics of Compton detectors. 3) Spatially-differentiated germanium detectors (3D-GeDs): GRIPS flight detectors post-flight – The GRIPS cryostat spent one year on the ice. We need to know how it fared, and whether it can be re-used. We have already cooled down the cryostat again (no leaks!! ), and will soon be ready to start this work, and it will involve a lot of data-taking and comparison with previous calibrations. The student will learn about germanium detectors and their electronics, operation of pumps and cryogenic equipment, and data taking and analysis. This part of the project will probably take about a person-year to complete, though not at full time. 4) Spatially-differentiated germanium detectors (3D-GeDs): NRL ASICs – After task 3) is completed, it is the project’s intent to test new application-specific integrated circuits (ASIC) from the Naval Research Laboratory (NRL), to likely replace the ones currently in use by GRIPS. 5) Test of grid imaging concept – With either sets of detectors described in 3) and 4), we need to put radioactive sources in front of our imaging grid, and look at the response on the spatially-differentiated GeDs placed on the other side of the grid. The goal is further proof of the mono-grid imaging concept, which could not be done in flight due to the absence of strong solar flares. 6) Prepare for the next GRIPS flight! (to be proposed in 2019, for flight in ~2022-2023) – NASA has already invested quite a bit of money in the GRIPS project, and so we are well-placed to be funded for subsequent balloon flights to fully mature the project. The long-term goal for GRIPS is to have the instrument flown on a spacecraft, to catch many flares and make new discoveries! The GRIPS team is confident the above items are the backbones of a very successful PhD experience at the Space Sciences Laboratory. If interested, please visit http://grips.ssl.berkeley.edu/ and contact Dr. Pascal Saint-Hilaire for more details. Students must have coding experience (e.g., Matlab, Python, etc.) to be considered. If interested, please visit http://stardustathome.ssl.berkeley.edu/about/stardust-mission/ and https://genesismission.jpl.nasa.gov, and then contact Dr. Andrew Westphal at westphal@berkeley.edu for more details.